Thanks to Bud Stone, president of the Grand Rapids Area Chamber of Commerce, for sharing his latest Chamber Update with our VFVC blog readers. 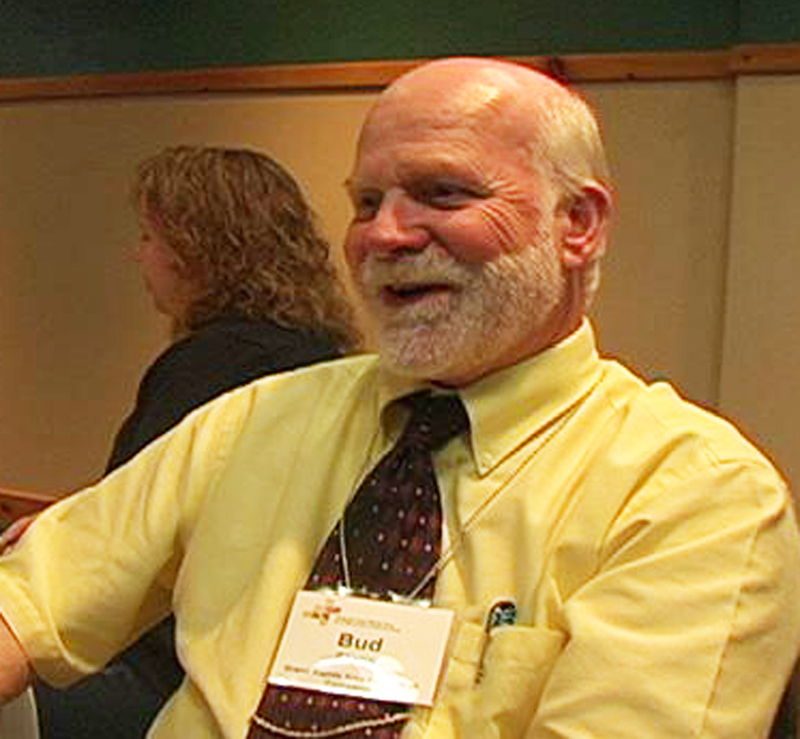 A couple of weeks ago, I attended a Climate Change meeting in Duluth that featured some interesting data on greenhouse gas emissions. The speaker was Tom Mullikin, who works with the Charlotte law firm of Moore and Van Allen as a senior environmental attorney. His practice focuses on corporate compliance, regulatory relations and legislative representation. The data he presented showed that of all of the greenhouse gas emissions in the world, 94.47 percent come from natural sources. The highest contributors in the natural emission category are C02 from breathing, decay, forest fires and volcanoes, Methane from wetlands and termites and Nitrous Oxide from bacteria in tropical soils and the ocean. Humans contribute only 5.53 percent to the global emission pie. This may sound pretty trivial, but it is still enough to influence climate change. If you take this data trail one step further, you will find that of the 5.53 percent of global human-made emissions, China contributes 18.30 percent and the US contributes 17.44 percent and Minnesota responsible for only .37 percent. .37 percent is one third of 1 percent of all of the global human-made greenhouse gas emissions – not very significant compared to the 94.47 percent of global emissions that happen naturally. Of the 94.47 percent of natural occurring global greenhouse gas emissions, C02 or Carbon, is 70 percent. OK. Now I want to share with you some other data that we received from the Science and Information Resources Division of the Ontario Ministry of Natural Resources, when we were in Thunder Bay a couple of weeks ago with the Blandin Foundation’s Vital Forests for Vital Communities Project, Seeing the Forests AND the Trees. Our best opportunity for reducing naturally occurring and human-made carbon emissions are in our forests. Trees use carbon and store it within themselves. During the process of using carbon, trees produce oxygen and release it into the air. The process is photosynthesis. You learned about it in grade school. The process of storing carbon is sequestration. It’s a new buzz word that you hear when ever someone talks about removing carbon from the atmosphere. Now comes the “so what”? Forests have a Carbon Cycle. It goes like this: young forests hold less carbon than old forests, but absorb a lot to grow quickly. Old forests hold more carbon but storage rates decline as growth slows. For over all health, old forests have to die and be replaced by young vigorous forests, just like humans. Nature does this by using fire and other natural disturbances, which release C02. Or, we can do this by harvesting trees and capturing the C02 in forest products. Both of these activities result in new forest, but fire and decay releases C02 while wood products store carbon for the long term. Back to the beginning. Minnesota does not contribute much to the global greenhouse gas emissions problem, but Minnesota’s Forests can be a significant player when it comes to reducing carbon in the atmosphere. We just need to manage our forests properly. Letting them burn or fall down and rot adds to the global emissions problem. Harvesting mature timber and growing new trees does the opposite. One more interesting fact for you to consider. Wood as a biofuel is carbon neutral. Wood used in place of fossil fuels actually reduces green house gas emissions. So, go ahead and light a fire in your fire place, sit down in your favorite old wooden rocker next to your wooden end table inside of your wood framed house and understand that you are contributing to the solution, not the problem. 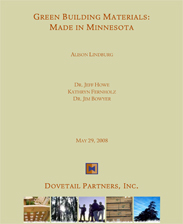 The report includes an introduction to True North Woods – a group marketing effort, supported in part by Blandin Foundation, to promote certified local, green, quality products from “cold-forged forests of Northern Minnesota.” Members in the True North Woods collective branding effort make a wide range of “Minnesota grown” wood and forest products, from building and construction materials to gift and specialty items. The report concludes that opportunities exist to maximize the economic, social and environmental benefits of green building efforts by using locally-sourced forest products. Buying and building with Minnesota-grown is good economic development, AND good for the forest!